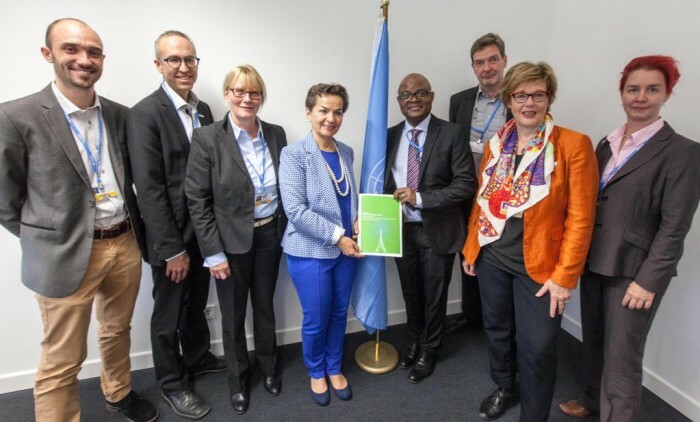 Today a statement signed by 154 religious leaders from different faith groups has been handed over to the Executive Director of the United Nations Framework Convention on Climate Change, Christiana Figueres. While negotiators representing 194 countries gather in Bonn this week to work on a draft text for December’s climate conference in Paris, religious leaders are issuing this call for an ambitious climate agreement, remind all governments to commit to emission cuts and climate risk reduction, and pledge important contributions from their own faith communities, including divestment from fossil energy. Among the signatories are: Rev. Dr Olav Fykse Tveit, General Secretary of the World Council of Churches, Archbishop Thabo Makgoba, Anglican Church of South Africa, Archbishop Pedro Barreto Jimeno, speaker of the Pan-Amazonian Ecclesial Network (REPAM), Imam Ibrahim Saidy, and Sulak Sivaraksa, International Network of Engaged Buddhists. Coordinated by ACT Alliance, CIDSE, Lutheran World Federation (LWF), Religions for Peace, and the Word Council of Churches, a common statement has been published today in Bonn, Germany. The statement was handed over to Ms. Christiana Figueres by Cornelia Füllkrug-Weitzel, Director of Bread for the World, Germany, Karin Kortmann, Vice President of the Catholic Lay Council of Germany. “We urge governments to commit to building climate resilience, phasing out fossil energies and reaching zero emissions by mid century. We call for a robust mechanism to review and ratchet up ambitions, transparency and accountability rules applicable to all, and the provision of finance and support to poor and vulnerable countries”, said Cornelia Füllkrug-Weitzel. “Guided by our religious beliefs, we as faith leaders have come together to call for an ambitious Paris outcome. In the past month the UN family has decided to take responsibility for both, environment and humankind by approving the Agenda 2030. In Paris the heads of states and governments have the chance to give evidence, how serious they are. The survival of millions of human beings depends on them,” said Karin Kortmann. This call builds on a growing number of calls from faith groups made throughout the last 12 months, such as the Pope’s encyclical Laudato Si’, the declaration of the New York Interfaith Summit, the Lambeth Declaration, and the Islamic declaration on climate change. Such calls also mark the engagement of different faith groups working together towards the same goals. The message from faith groups is now unequivocal.